Over 46 years of service! Since 1972 Diane has been full-time organist at Salem and she has never missed a Sunday except for vacations. “I am so happy that I have been given the ability to play, starting with the piano as a child, and then the organ in later years, continually over the past 45 years, for the church that I have been attending all my life,” says Diane. She plays, even if she is ill. And, if you know Diane, you understand this: never ask her to take a vacation around the holy days of Christmas and Easter because it won’t happen! From the bellow in the basement to the pipes in the attic (519 pipes to be exact), organist Diane Ledden commands this original M. P. Moller organ from her console inside the sanctuary of Salem United Methodist Church. Salem’s humble beginning dates back to 1774 in a building known as the Geeting Meeting House which was located off Mt. Hebron Road. Fast forward 121 years, and three church buildings later to the year 1895. Salem now sits as a church in the center of town. It was in this year that an M.P. Moller organ was acquired by the church. As the story goes, Salem, then a German Reformed Church, originally turned down an offer from Mr. M.P. Moller, but he countered with an offer that Salem could not refuse. In came the organ and it has been making music ever since, even after surviving a church fire on October 16, 1943. Salem Church takes great care in the maintenance and tuning of the organ, continuing to make music and history in this small, rural town. Using a combination of keys, switches, and buttons that control airflow through an intricate system, Diane Ledden brings to life beautiful music of trumpets, flutes, and chimes every Sunday, and has been doing so for the last 45 years. On April 23, 2017, in true United Methodist fashion, a potluck-style banquet was held in Diane’s honor where over 50 people gathered to celebrate her steadfast service to Salem. Guests included family, friends, and one very influential person, Mrs. Patsy Slick, who was Diane’s Elementary Sunday School teacher. At 6 years of age, Diane began taking piano lessons. She recalls her mother making her practice at least 30 minutes a day when Diane would rather be outside playing with the neighborhood children. Towards the end of elementary school, Mrs. Slick began inviting Diane to play a few hymns on the piano at the start of class. 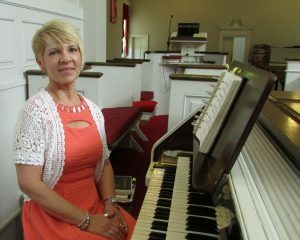 Diane was later promoted to playing the piano for the combined opening of Sunday School which included students from high school age to adult. A few years later, Diane started taking organ lessons from Dorothy Burkholder at Shockey’s Piano and Organ Store in Hagerstown. Taking up the clarinet in middle school, Diane began taking clarinet lessons as well. Both lessons were held weekly on the same night! Diane continued playing clarinet through high school where she played for the Boonsboro High School Marching Band. It was just a matter of time before the keyboard at Salem became Diane’s on a full-time basis. Since 1972 Diane has been full-time organist at Salem and she has never missed a Sunday except for vacations. “I am so happy that I have been given the ability to play, starting with the piano as a child, and then the organ in later years, continually over the past 45 years, for the church that I have been attending all my life,” says Diane. She plays, even if she is ill. And, if you know Diane, you understand this: never ask her to take a vacation around the holy days of Christmas and Easter because it won’t happen! You might be wondering if Diane has a favorite hymn. She enjoys playing many traditional hymns including “Holy, Holy, Holy! Lord God Almighty,” “In The Garden,” “Joyful, Joyful, We Adore Thee,” “For the Beauty of the Earth,” and “Love Divine, All Loves Excelling” just to name a few. But one hymn is particularly sentimental to Diane – “What A Friend We Have In Jesus.” This was one of the very first hymns she learned how to play as a child. It is this hymn that remains her favorite of all time. Our historic local church here in Keedysville is richly blessed by Diane; she is officially part of the legacy of our church “at the heart of the community with the community at heart.” Salem is a welcoming community of faith and music is a part of Salem’s mission to “Proclaim and live the Gospel of Jesus Christ.” Salem invites you to join them on Sundays for worship with Children’s Church at 10:30 a.m.; Sunday School for all ages at 9:15 a.m.
Resource: History of Salem United Methodist Church; 2014; updated 2016. Salem is a Safe Sanctuary church. To learn more about Salem UMC, please visit their website at www.salemcommunity.org.